Lame Adventure 9: A Shout Out to Lola on Her Birthday! Sunday is my friend Lola’s blankety-eighth birthday, and I promise her that Milton and I will attend her celebration. Lola is a world traveler from Spain, and although she has resided in the US for at least fifteen years, she retains a sense of style and taste that is true to her European heritage. Simply said, she’s inherently hip, someone that is always well put together no matter what the weather is like, and I imagine she’ll continue to be that way on her eighty-eighth birthday. That’s Lola. I, her stumblebum American friend, who has seen much of the world primarily via a movie screen, is also Lola’s sartorial antithesis lacking any taste whatsoever in fashion. I don’t eat as healthy as she. I don’t exercise nearly as often; my body is yoga and Pilates averse. Thanks to twelve years of Catholic schooling, I hold a Masters in Atheism, and I am about as Zen as a year-old Jack Russell terrier on speed. Despite these and many other differences, our mutual interest in film, theater and writing has been the glue that has held us together for ten years. Conversation with Lola has always come easily and I enjoy her company immensely. I assume she sees me as an oaf she can tolerate. 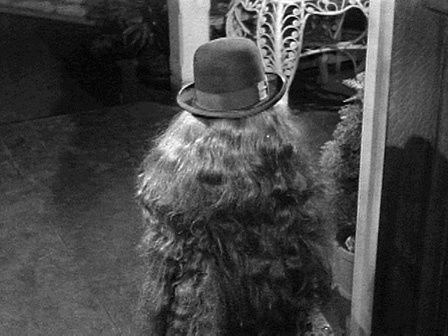 When Lola, Milton, and I last got together, in October for a screening of French writer-director Catherine Breillat’s Blue Beard at the New York Film Festival, my graying tresses were looking a tad shaggy, not quite Cousin Itt level but it doesn’t take long for me to channel Patti Smith. 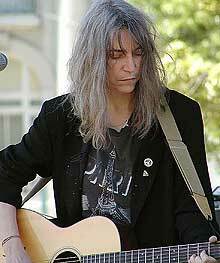 Patti Smith on a bad hair day. Feeling very self-conscious of looking like a fright-in-the-making, I defensively babbled about getting my hair cut and colored soon, or maybe it was yak about having a total makeover. Whatever I said, Lola responded with a monosyllabic grunt. Breillat will not be receiving funding for her films from the Wonderful World of Disney in this lifetime. Fast forward to the present, I am perversely determined to make an effort in the appearance department when I next see Lola. Since it’s a little late in the day for a nose job, implants, liposuction, or acquiring taste in clothes, I settle on having my hair the aforementioned cut and colored. The dynamic duo that is Aneta, my colorist from Poland, and Manal, my stylist from Egypt, take one look at me, excuse themselves briefly, scream and vomit, and then get to work. Two hours later, I leave the salon looking ready for my behind the head close up, and Lola’s birthday gathering at one of her favorite neighborhood bars, The Brooklyn Inn. Although I promised Lola I’d spare subjecting her “the Martini Max treatment” (see Post 7), I still happen to have Peabody and Sherman’s Wayback Machine on loan, so with that in mind, I’m going to renege on my promise and share a Lame Adventure from back in the day featuring Lola and yours truly. Lola and I met when we had screenplays selected for a series of film industry networking opportunities at the Independent Feature Project’s Market back in 2000. My project, a niche comedy that made many people laugh even though no one knew what to do with it, died, while Lola’s film noir showed signs of life before expiring two years later. She went through a lot with her script, and I admired how good she was at getting it read. Unfortunately, she had yet to encounter anyone that was willing to produce it and she was feeling frustrated. 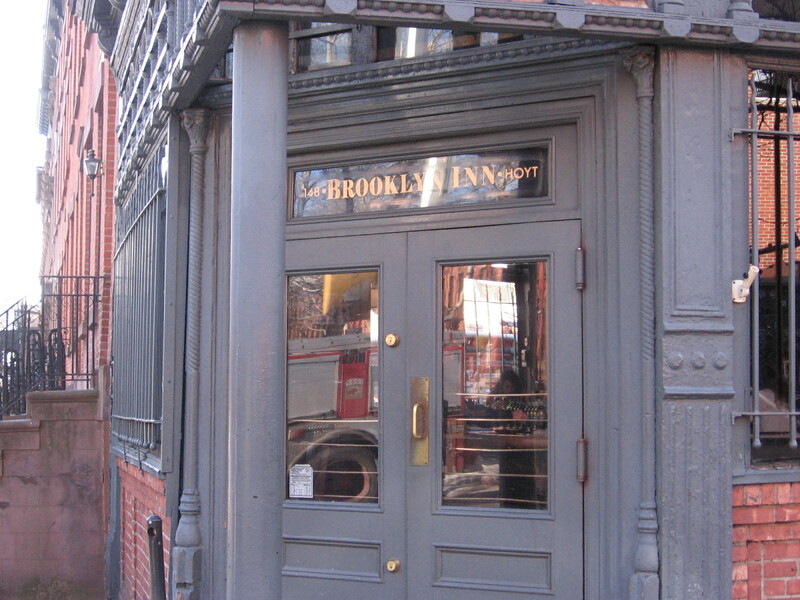 On a Friday night in early spring 2002, Lola and I met for a drink at the bar in the Plaza Hotel. She was feeling pretty beaten down about her script, and needed to vent to someone about it. She noticed that sitting behind us at a table was, “That guy from As Good as it Gets.” I turned and looked but acted as if I wasn’t looking, because that’s what you’re supposed to do when you’re in the presence of a celebrity in New York. I said, “Oh, you’re right. 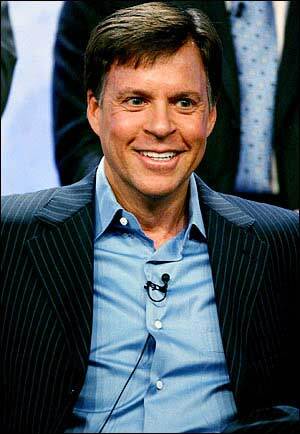 Bob Costas.” Lola sipped her drink and asked, “Who? He’s that guy, Greg Something, don’t you know?” I said, “Yeah, he’s Greg Kinnear. I always get him confused with Bob Costas.” I explained to Lola that they both hosted a late night talk show on NBC called Later in the Nineties. She gave me her too much information look, we paid our tab, and left. As we were walking west on Central Park South, Lola continued to vent rhetorically about her script, a common practice amongst writers that wonder why their work is being denied the recognition they’re certain it deserves. 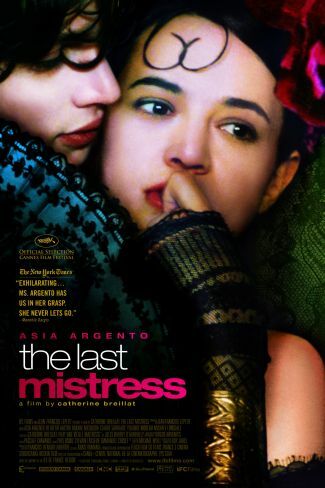 Since she’s Spanish, many people reading her screenplay were suggesting that it might be a property for Penelope Cruz. I thought that was a great idea, but that seemed to go nowhere. She asked me, “Who else is hot right now?” Bridget Jones’s Diary had scored a huge hit a year earlier, so I suggested Renee Zellweger. Lola, whose tastes run towards serious drama, bleated loudly, “And should I turn my script into a vacant comedy and call it The Color of My Lipstick?” We then both looked left into the window of a restaurant where Renee Zellweger was dining. 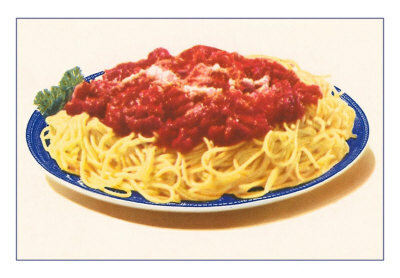 She looked up from her meal, I seem to recall with spaghetti dangling from her mouth, and looked right at us. Renee over a happy meal. I agreed and for some inexplicable reason we hotfooted it up the block with me donning my ever ready weasel guise asking, “Do you think she heard you insulting her?” We were being pursued, not by Renee Zellweger charging us with a plate of pasta, but by a passel of tourists from Spain. They heard Lola’s accent and gushed their guts out to her in Spanish if that was indeed Renee Zellweger. Lola was gracious and played guide to the star struck group. Plate of pasta not hurled at us. Since I took French in high school, I did not understand a single word of what anyone was saying. I was there, too. Believe me, it happened. I never thought Costas and Kinnear looked alike until this post. Scary! well, happy birthday, lola. i love this story. I think I know this Lola person. Whatever Lola wants, Lola gets, including a friend with a very funny blog. I’m looking forward to reading more. Thank you for coming to my bday! Thank you for the story. Long live to more lame adventures together!